(SitNews) - The mushers were gone, and so were the 640 dogs that pulled them out of town. A few days earlier, the volunteers who gave life to Iditarod had climbed into their single-engine planes and lifted off the ice, carrying their noise along with them. 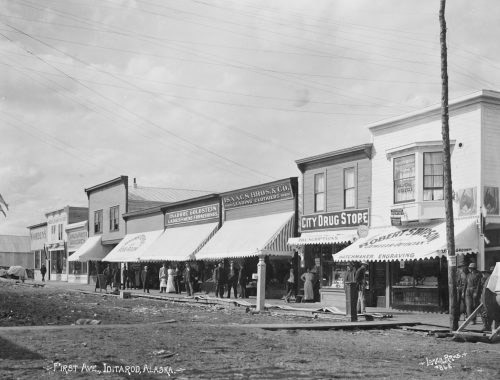 First Avenue in the town of Iditarod, pictured here around its peak in 1911, featured storefront awnings and wooden sidewalks. Iditarod got its start after two prospectors found gold at nearby Otter Creek on Christmas Day, 1908. The first steamship to reach the site of Iditarod arrived from Fairbanks. The Tanana made the 1,000-mile trip via the Chena, Tanana, Yukon, Innoko and Iditarod rivers in June 1910. Ships only made it to Iditarod during high-water periods, like snow-melt time in May and June. The Mitchell Hotel in Iditarod, where travelers slept in the early decades of the 1900s, is falling down today. The Iditarod River and the town’s famous name is “probably an English distortion by prospectors of the name of an Indian village” on the river, wrote Donald Orth in his Dictionary of Alaska Place Names. 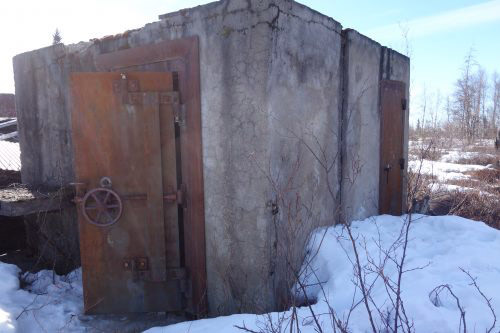 This vault, with two-foot concrete walls, was once inside a bank building at Iditarod. 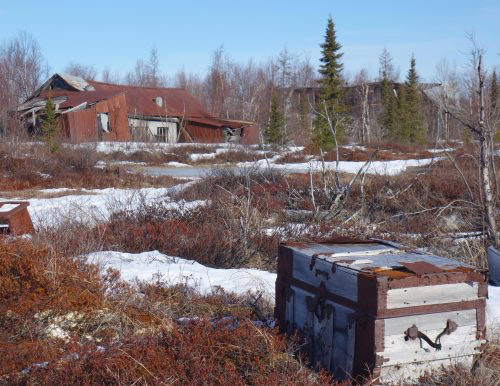 A travel trunk sits on the tundra in the ghost town of Iditarod. The town’s decline began when the Guggenheim-owned Yukon Gold Co. purchased most of the claims in Flat. Company executives shipped dredges from the Klondike to Flat. The huge gold-digging machines required many fewer men to operate. 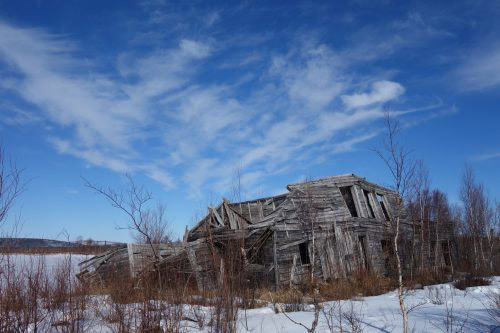 By the 1920s and 1930s, miners moved many Iditarod buildings to Flat. The Northern Commercial Co. kept a store in Iditarod, run by Joe Mitchell, who had owned the hotel. When company shareholders closed the store in 1951, Mitchell left Iditarod, catching a plane out of Flat. As the plane flew over Iditarod, Mitchell looked down on empty streets and buildings leaning into the tundra.